Since January 2012, more than 2,900 rockets and mortars fired from Gaza have hit Israeli civilian areas. Only 15 rockets were fired into Israel during 2016, the lowest number of rocket attacks in 11 years. July 26 11 Rockets Nine rockets were fired from Gaza into Israeli territory over the course of two days from July 25-26, 2018. All missiles landed in open areas near the border fence and no injuries were reported. A number of Hamas positions in Gaza were struck by Israel in retaliation, killing three members of the terror group. Additionally, two rockets fired by ISIS militants in Syria landed in the Sea of Galilee. July 14 200 Rockets/Mortars A barrage of 200 rockets and mortars were fired from Gaza towards Israel on July 14, 2018. The Israeli Iron Dome Missile Defense system only intercepted forty of the projectiles. Three Israelis were wounded after a rocket struck their house in Sderot. The Israelis carried out airstrikes on over forty Hamas military installations in retalliation. 13 Rockets 13 rockets were fired from the Gaza Strip towards Israel on the night of June 26 and early morning of June 27. Three of these rockets were intercepted by the Iron Dome system. This rocket fire was in retaliation to the attempted assassination of a Hamas militant; the Israeli military blew up his car, but he was not inside of it at the time. 45 Rockets 45 rockets were fired by terror groups in Gaza towards Israel during the middle of the night on June 20, 2018. Seven of the rockets were intercepted by the Iron Dome system, with other rockets landing in unpopulated areas and three striking near community centers and schools. No injuries were reported, but most Israelis in border communities spent the night in bomb shelters. In response, the Israeli Air Force struck 25 Hamas targets in Gaza. May 29 At Least 30 Mortars/Rockets At least 30 mortars and rockets were fired in two volleys from the Gaza Strip towards Israeli territory on May 29, 2018, following weeks of Palestinian protests at the Israeli border. Most projectiles were intercepted by the Iron Dome, but some made it through. One missile exploded in the yard of an Israeli kindergarten. Five Israelis were wounded in the barage, most by mortar shrapnel. The Israeli military hit back forcefully, striking approximately 30 Hamas military installations. This was the single largest attack by Gaza terrorists on Israel since the 2014 Gaza war. February 1 1 Rocket One rocket was fired from the Gaza Strip around 11:30 p.m. on February 1, causing no damage or injuries. January 15 1 Rocket One rocket fired from within the Gaza Strip towards Israel landed in Gaza, striking a home and injuring three residents. January 4 3 Rockets Three rockets were fired towards Israel from the Gaza Strip, all landed in Israeli border communities in open fields, no injuries reported. In retalitaion the Israeli Air Force struck central terrorist infrastructure tragets within Gaza. December 29 2 Rockets The Iron Dome intercepted two rockets fired towards Israel from within Gaza. December 17 2 Rockets Two rockets were fired from within the Gaza Strip, with one landing near the border on the Israeli side and damaging a home, and the other landing in a field. Although a home and a car were damaged, no individuals were injured in the attack. December 15 1 Rocket A rocket fired from Gaza towards Israel fell short and landed on the home of top Hamas official spokesman Mushir al-Masri's brother. December 11 2 Rockets Two rockets were fired separately from within Gaza towards Israel, one was intercepted over Ashkelon by an Iron Dome missile and the other landed in Eshkol. No injuries were reported. November 30 10-12 Mortars Approximately ten to twelve mortars were fired into Israel by Palestinian Islamic Jihad on the night of November 30, 2017. No injuries were reported. Soon after, the IDF responded with tank and artillery fire on four Hamas positions near Beit Hanoun and two Hamas targets in central Gaza. 1 Rocket One rocket was fired towards Israel from the Gaza Strip, but it landed within the Strip. No damage or injuries were reported. The IDF destroyed a Hamas watch-tower station in Southern Gaza in retaliation. 1 Rocket One rocket was fired from the Gaza Strip, landing in Israel and causing no injuries. The IDF responded by striking a Hamas facility, even though no militant group in Gaza claimed responsibility for the attack. June 26 2 Rockets Two rockets were fired from the Gaza Strip into Israel, landing in an open area near the Shaar HaNegev Regional Council and causing no injuries. In retaliation, the Israeli Air Force attacked and destroyed two Hamas outposts in Gaza City and Rafah. Several mortars hit Israel for the second day in a row, prompting the IDF to respond by striking two Syrian artillery positions and a Syrian regime ammunitions truck. Ten mortar shells launched from Syria landed in the Golan Heights, no injuries were reported. The IDF announced the strikes were likely accidental spillover fire from fights between rebels and Syrian forces on the other side of the border, but retaliated anyway in a strike that killed two Syrian soldiers. May 22 1 rocket One rocket was fired from the Sinai Peninsula into Israel on the second day of U.S. President Donald Trump's visit to the country. A siren was not sounded because the rocket was headed towards an open area, and eventually landed without causing any damage or casualties. One rocket was fired into Israel from the Sinai, and hit a greenhouse in a community on the Egypt-Israel border. The rocket was fired by Islamic-State affiliated militants, and caused no injuries. One rocket was fired into Israel from the Gaza Strip, and hit an empty area in Southern Israel. The Israeli military responded by striking five Hamas positions in the Strip, seriously injuring four Hamas militants. Two rockets were fired into Israel from the Egyptian Sinai Peninsula, striking open fields in the Eshkol region of Israel and causing no injuries. Four rockets were fired into Israel from Sinai, three were intercepted by the Iron Dome and one struck land in an empty field. The Islamic State affiliate in the Sinai claimed responsibility for the rockets. One rocket was fired from within the Gaza Strip, landing in the Hof Ashkelon area. No injuries were reported, in retaliation IDF tanks and aircraft struck and destroyed six Hamas positions in the Gaza Strip. One rocket fired from within the Gaza Strip landed on a street in the Southern Israeli town of Sderot. The Iron Dome Missile Defense System failed to engage the rocket, but luckily nobody was injured in the strike. Air strikes were carried out on Hamas targets in Gaza in retalliation for the rocket attack. Two mortar shells were errantly fired over the Israeli border from Syria. These mortars were brought down by the Iron Dome missile defense system, which had never before intercepted stray mortar rounds from Syria. One mortar shell was fired from Syria, and landed in the Golan Heights. No injuries were reported, and the Israeli military responded by striking Syrian military installations. One rocket was fired from Syria, landing in the Golan Heights and not causing any injuries. The fire was attributed to spillover from the Syrian civil war, and in response the Israeli Air Force struck Syrian military targets. One rocket was fired from Gaza and landed near Sderot and Sha'ar Hanegev, the rocket was found between two houses in Sderot. No injuries were reported. Hamas military installations were struck the next day and night by Israeli fire in multiple unusually heavy retaliatory strikes. One rocket was fired from Gaza into Israeli territory by the small Salafi jihadist group Ajnad Beit al-Maqdis. The rocket landed in an open Israeli field, and no injuries were reported. The IAF carried out strikes against Hamas positions in Southern Gaza in retaliation. Many mortar rounds were fired at Israeli forces engaged in “operational activities” near the security fence in the Southern Gaza Strip during the first week of May 2016. These mortars were meant to disrupt the Israelis, who were engaged in detecting and destroying Hamas attack tunnels dug between Gaza and Israel. No injuries were reported, but tunnel detecting equipment was damaged. In response, the IDF fired on Palestinian Interior Ministry buildings, Hamas outposts, and other targets, damaging structures and causing two civilian injuries. The Israeli Air Force struck back at the militants as well, hitting four Hamas targets on May 6. A rocket was fired by Hamas militants from Gaza on May 7, 2016, landing in the Eshkol region and exploding without damaging structures or injuring Israelis. In response, the Israeli Air Force struck two Hamas targets. Four rockets were fired from Gaza towards Israel, all fell in open areas. No injuries reported. One rocket was fired from Gaza, landing in an open area in the Sha'ar Hanegev regional council and not causing damage or injury. Five rockets were fired from Gaza at Israel, two landed in open areas in Israel and three landed within the Gaza Strip. At least three rockets were fired over the Lebanon border, landing in Israel. The IDF blamed the Lebanese military for the strikes, and responded with their own artillery fire. No injuries were reported. One rocket was fired from Gaza, setting off rocket sirens in the Sha'ar HaNegev region of Southern Israel. The rocker landed in the Gaza Strip. The IDF struck two sites in Gaza in retalliation, no injuries were reported. One rocket was fired from Gaza and set off rocket sirens in Southern Israel, and landed in an open area in Shaar HaNegev. Israeli jets struck a Hamas base in response, no casualties were reported in either incident. One rocket was fired from Gaza and landed in an open area in Southern Israel. No damage or casualties were reported, and sirens in Israel were not set off. One rocket was fired from Gaza and landed near the border wall seperating Israel from Gaza. Rocket alert sirens in Israel did not activate, and there were no reports of injuries or damage. One rocket was fired from Gaza and landed in Southern Israel in a field, no injuries reported. In response, Israeli jets struck Hamas positions in Gaza, with no casualties reported. One rocket was fired from Gaza at Southern Israel, no injuries reported. One rocket was fired from Gaza and landed in Israel's Sha'ar Hanegev region. No injuries or property damage reported. One rocket was shot down by the Iron Dome over Israel after being launched from the Gaza Strip. In response to this attack as well as attacks during the previous days, the Israeli military conducted air strikes against Gaza militant positions. These strikes claimed the lives of a pregnant 30-year old Palestinian woman and her 3-year old daughter, and injured several other members of her family. Two rockets were fired by Gaza militants, both landed and exploded in the Gaza Strip. No injuries reported. Palestinians fired two rockets from Gaza on Sunday October 4, one of which exploded in a field in Eshkol with no injuries. The other rocket did not make it out of the Gaza Strip but still set off warning sirens in Israel because it was originally headed towards a populated area. One rocket was fired towards Israeli territory from within the Gaza Strip on September 30, 2015. The missile was intercepted by the Iron Dome defense system over the Israeli city of Ashdod, and no injuries were reported. In response, the Israeli Air Force struck four Hamas military sites the next day. Two rockets were fired from the Gaza Strip by the Sheikh Omar Hadid Brigade. One rocket landed in Sderot and damaged a home, while the other rocket was shot down by the Iron Dome missile defense system over Ashkelon. No injuries were reported. The Israeli Air Force struck multiple targets in retalliation, including a Hamas telecommunications site. One rocket was fired from the Gaza Strip by an ISIS linked group, the Sinai Province of the Islamic State. The rocket fell within Gazan territory, no injuries were reported. One rocket was fired from within the Gaza Strip and exploded in Israeli territory on Thursday, August 27, 2015. In response, the Israeli military struck the position from which the rocket was fired, and also destroyed a Hamas weapons factory in Gaza. No injuries were reported. Multiple rockets struck an Israeli village near the Lebanese border, and Israel responded by striking militant positions within the Syrian Golan Heights. The rockets were fired from within Syria, and Israel blamed the group Islamic Jihad for the attack. Three rockets were fired by Jihadist groups from the Gaza Strip. Two of these rockets exploded in Gaza and one made it to Israel; no injuries were reported. Two rockets were fired by Hamas at Israel. The rockets landed in unpopulated areas near the border, no injuries reported. Two rockets were fired from within Gaza on June 6, 2015. No casualties or significant damage were reported, and the rockets landed in empty fields. The Omar Brigades again claimed responsibility for this attack, and it seemed as if they were trying to provoke Israel into another was with Hamas. Israel bombed Hamas facilities in response, causing damage but no casualties. Two rockets were fired from within Gaza on Wednesday, June 2, 2015, striking Southern Israel near Ashkelon. No significant damage or injuries were reported. In response to the attack the IDF carried out air strikes against the facility where they believed the rockets were fired from. A Salafist group associated with the Islamic State, the Omar Brigades, claimed responsibility for the attack, stating that it was in response to the Hamas police officers killing of an Islamic State supporter during the previous day. At least one rocket was fired towards Israel from within the Gaza Strip on Tuesday, May 26, 2015. Sirens went off and explosions were heard in Southern Israel, but no injuries were reported. Israeli security officials believe that this attack was carried out by Palestinian Islamic Jihad members. In response, Israeli aircraft bombed four sites in Gaza the following day, known to be Hamas and Palestinian Islamic Jihad training areas. In the first rocket attack of 2015, Hamas militants fired a rocket into Israeli territory on Israel Independence Day. Israeli warning sirens sounded and the rocket exploded on impact but caused no casualties or damage. The IDF responded by shelling a base that was known to be used by the militant group, also causing no casualties. A rocket fired from the Gaza strip landed in the Eshkol Regional Council, no injuries were reported. In response to this attack, Israel carried out it's first air strikes in Palestinian territory since the end of Operation Protective Edge. Israeli Air Force jets struck a Hamas training camp in the southern Gaza Strip. A Qassam rocket fired from within the Gaza Strip struck Southern Israel in the Eshkol region. The rocket was originally thought to have fallen and exploded within Gaza, so no Code Red sirens were sounded. In response to this attack, the Israeli goverment closed the Erez and Kerem Shalom border crossings on November 1, repoening them 2 days later on November 4. Hamas security forces arrested 5 individuals who them believe were behind the attack. For the first time since the cease-fire took effect on August 26, a rocket fired from Palestinian territory screamed through the sky and landed in Israel. The rocket landed near the Gaza border, inbetween Eshkol and Sdot Negev. No Palestinian group has claimed responsibility for the attack, no injuries or major damage reported. More than 100 rockets were fired from Gaza into Israel on Tuesday August 26 before the cease-fire was announced. Multiple rockets were intercepted by the Iron Dome, and at least 2 fell within the Gaza Strip. 2 people were killed and multiple people injured when a mortar hit Eshkol regional council. A home in Ashkelon suffered a direct hit and there were multiple injuries from shrapnel, and a rocket hit a playground in Ashdod. At least 130 rockets and at least 30 mortars were fired from Hamas militants into Israel on August 25. Hamas took responsibility for an M75 rocket launched at Tel Aviv. Late afternoon saw a drastic increase in mortar and rocket fire, with the Iron dome intercepting one rocket bound for Ben Gurion Airport. Israeli military responded to rockets coming from Lebanon by firing artillery shells at the site of the launch. The Iron Dome struck down a rocket above a main shopping center in Ashdod, sending debris crashing through the mall's glass ceiling and injuring multiple people. Multiple injuries reported including a woman from Eshkol hit by shrapnel. At least 60 rockets and an unconfirmed number of mortars were fired from Hamas militants into Israel on August 24. 2 rockets were also confirmed to have been fired from Syria into the Golan Heights. The intention and responsibility for these rockets has not yet been ascertained. These rockets were either intercepted by the Iron Dome or hit open areas in Eshkol and Sdot Negev. Hamas once again tried to fire on Tel Aviv. 93 rockets were fired from the Gaza Strip into Israel on August 23 including 2 rockets fired from Lebanon. Multiple injuries reported and multiple buildings were damaged. More than 50 rockets were fired from the Gaza Strip towards Israel on August 22, including one that struck a home in Sha'ar HaNegev and killed a 4 year old boy. Daniel Tregerman was playing with his family when a red alert siren sounded and a mortar slammed into the side of his home. He was killed by shrapnel and was laid to rest later in the weekend. Rockets were also fired at Tel Aviv. 104 rockets and twelve mortars were fired towards Israel on August 21. After heavy rocket fire pounded Southern Israel in the morning, an Israeli man was seriously injured by shrapnel as a Hamas rocket hit an Eshkol building. The man was attending his son's third birthday celabration at his son's school when the sirens went off and he immediately rushed to get all of the children inside. He was hit by shrapnel as the bomb exploded outside of the school. A number of cows were killed when a projectile hit the barn that they were in. One hundred and sixty eight rockets were fired from Gaza into Israel today. No injuries reported. . Hamas fired two rockets at an Israeli gas installation off the Gaza coast. 50 rockets were fired from Gaza during the newly agreed to 24-hour extension to the previous week's 5 day cease-fire. Hamas militants broke the cease-fire early in the morning with a barage of 5 rockets, and Israel retaliated with air strikes on 25 locations. One of these rockets struck an Israeli highway, others hit open areas in Eshkol and Beersheba. No injuries reported. A single rocket was fired from Gaza into Israel, landing in an open area in Eshkol. No injuries reported. 7 rockets were fired at Israel from Gaza, the Iron Dome intercepted one and the others landed in open areas. No injuries reported. 8 rockets were fired into seperate parts of Israel hours before the end of the 72-hour ceasefire. The Iron Dome intercepted four rockets, while 35 hit open areas in Eshkol, Sderot and Ashkelon. No injuries reported. 30 rockets hit open areas in Eshkol and Hof Ashkelon. No injuries reported. After the cease-fire ended, rockets immediately started being shot from Gaza. 2 overnight before the cease-fire ended, and a volley of "at least" 35 rockets at 8a.m. immediately following the cease-fire's end. 31 rockets were fired at Israel in just a few hours during a cease-fire that was supposed to last from 10a.m. to 5p.m. 26 were fired later in the day. No injuries reported. 119 rockets and mortars were fired towards Israel, with the Iron Dome taking down 8. No injuries reported. 84 rockets were fired towards Israel, no injuries reported. 16 rockets were fired at Israel, many landing in Eshkol Regional Council and Sha'ar HaNegev. No injuries reported. 32 rockets were fired at Israel, multiple impacts. 3 injuries: 14-year-old who had cut her leg, a 60-year-old man who fell and sustained moderate injuries, and a Chinese construction worker. 141 rockets were fired at Israel for an unconfirmed number of impacts. No one was injured. 79 rockets were fired at Israel for an unconfirmed number of impacts. No one was injured. At least four people were killed, while at least six others were wounded, some seriously and criticially, by mortar fire on Eshkol near the Gaza border early Monday evening. Because this was a mortar and not a rocket, there was no Code Red siren. Elsewhere, three rockets hit open areas in Eshkol and Iron Dome intercepted three more. 814 rockets hit open areas throughout Israel between the 16th and 27th of July. At least 105 rockets fired at Israel after Hamas rejects ceasefire proposal. An Israeli civilian is killed at the Erez crossing by a mortar attack from Gaza. Two sisters, aged 11 and 13, from a Bedouin villae near Beersheba, are seriously wounded. Three rockets are fired at Israel from Southern Lebanon, one striking an open field in Metula, with no reported injuries. An unconfirmed number of rockets fired from Gaza were intercepted on their way to Haifa, Hadera, and Zichron Yaakov. A fire started in Ashdod after one rocket hit a gas station, injuring eight. Three rockets are fired at Beersheba, but are intercepted by the Iron Dome. Later in the day, two rockets hit Beersheba, one causing four injuries. One rocket strikes farm land near the Be'er Tuvia Regional Council. Several rockets are fired at Ashdod, destroying a house, causing a gasoline explosion, injuring one woman. Two IDF soldiers are inured by mortar fire in Eshkol. Four rockets were intercepted over Tel Aviv; an unconfirmed number targeting the greater area hit lightly-populated locations. No casualties are reported. Hamas terrorists in Gaza assumed responsibility for an unconfirmed number of rocket strikes. 20 Israeli cities report rocket fire or air-raid sirens on and around 8:30 in the morning. The Iron Dome intercepts 21 of a confirmed 103 rockets fired. No injuries are reported. Damage is reported to a house in Eshkol and a fire was contained in Yeruham. Rockets were fired at Tel Aviv for the first time since 2012. An unconfirmed number of rockets targeting Jerusalem, Tel Aviv, and Beersheba are intercepted by the Iron Dome. No injuries and only light damage is reported. Rockets will continue throughout this operation. Hamas claimed to have fired 100 rockets across Southern Israel. The Iron Dome intercepted three rockets targeting the Eshkol area. One rocket hits an open field in Beersheba. One rocket hit the Eshkol Regional Council, injuring one IDF soldier. Soldiers were attacked by a rocket-propelled grenade along the Gaza border, injuring one. The IDF confirmed 80 rocket hits on the day. Seven rockets target Sha'ar Hanegev, four hitting a kibbutz. Two rockets hit eshkol, causing small fire that was quickly contained. Rocket hits were confirmed in Sderot and Hof Ashkelon. .One rocket was fired at the Eshkol Regional Council, landing in a field, lightly injuring an IDF soldier. An undetermined number of rockets and mortars were fired at Southern Israel throughout the afternoon, one being intercepted by the Iron Dome. One rocket was fired at Beersheba. Four rockets are fired at Sderot. One is intercepted by the Iron Dome. Two rockets targeting Okafim are intercepted by the Iron Dome. Seven rockets land in open fields in greater Southern Israel. One rocket was fired at an IDF instillation near the Gaza border, but missed. Seven rockets were fired at Eshkol. Two mortars are launched at Sderot. An undtermined number of mortars are fired at Keren Shalom, but only one hits. No known injuries. One rocket hits Sderot after midnight. Ten rockets are fired at Sderot and greater Southern Israel in the early morning hours. One rocket is fired at Ofakim. Four homes in Sderot are hit. A summer camp was hit, but the rocket failed to detonate. No casualities are reported. Gaza terrorists fire five rockets towards the Sdot Negev regional council, three rockets towards Ofakim, two rockets at Ashkelon, three rockets at Eshkol. In the afternoon and midnight hours, nine mortars hit the Eshkol area. The Iron Dome intercepted two rockets, and the rest landed in fields. No injuries or damage reported. Terrorists fire five rockets overnight at the Eshkol area. One falls in an open field near the regional council. Damage to vehicles and a packaging factory is reported, but no injuries. Gaza terrorists fire sixteen rockets in the early morning hours. Most of the rockets landed in open areas near Eshkol. One caused light damage to a home. No injuries. Four rockets were fired from Gaza into the south of Israel. Two were intercepted by Iron Dome, and two fell in an open area near the border fence. Terrorists in the Gaza Strip fired several rockets. Two struck factory in Sderot, causing it to burn down. All other rockets hit an open area. Six rockets launched from the Gaza Strip, four fell in open field, two intercepted by Iron Dome en route to Ashkelon. Mortar fire damaged military vehicle. Two rockets intercepted by Iron Dome, and a third lands in the south near Sderot. A rocket fired from Gaza struck an open field near Sderot. Later a rocket fired at Ashkelon was intercepted by Iron Dome. Two rockets fired from Gaza hit into a Sha'ar Hanegev Regional Council community and caused light damage to a structure. A rocket from Gaza landed in an open area in Ashkelon region. A series of explosions were heard in the evening in Asheklon, as four rockets had been fired from Gaza. Two were intercepted by Iron Dome, causing fragments to fall acros steh city. No injuries or significant damage. Hof Ashkelon reports two of three rockets fired from Gaza landed in the region. No injuries or damage. One rocket fired from Gaza came close to hitting a main road in southern Israel, but landed in a nearby field without causing any injuries. Early morning attack on Eshkol region. One rocket landed in a field and no damage was reported. Sha'ar HaNegev Regional Council reported one rocket explosion in open field. No damage or injuries. A rocket hit an open area in Eshkol. No injuries or damage. Mortar shell exploded near the fence in southern Gaza. No injuries or damage. Three rockets landed in the Hof Ashkelon and Sha'ar HaNegev Regional Councils, after rocket alert sirens. No injuries. Terrorists fired seven rockets during the last day of the Passover holiday. First three hit uninhabited areas and caused no damage. Anotehr two cause light damage in Sderot. One mortar shell landed close to the security fence in an open field, and late that night two more mortars were fired at Israeli soldiers. No injuries. Early morning alert in Asheklon Region, a rocket fell short. That evening a mortar landed in a kibbutz in the Sha'ar Hanegev Regional Council. Damage was reported but no injuries. Terrorists in Gaza fire a rocket into Israel. No injuries or damage reported. In the Hof Ashkelon Regional Council a rocket exploded in the open area, close to the border fence. No injuries or damage were reported. Three rockets were fired at Eilat, intercepted by Iron Dome. At least 16 rocket hits were identified in Israeli territory, out of over 78 rockets that Gaza terrorists fired, in the largest barrage of rockets since during Operation Pillar of Defense. Iron Dome intercepted at least five of the rockets. In response, the IDF hit terror locations in the northern and southern ends of the Gaza Strip with artillery fire. A total of 13 rocket hits were identified in Israeli territory. The peak was a barrage of five rockets fired at Ashkelon on January 15. On January 20, two rockets were fired at Eilat. There were no casualties and no damage reported in any of the attacks. Two rockets were fired from Gaza at Israel only a short time after world leaders and guests had left the burial ceremony for deceased former Israeli Prime Minister Ariel Sharon. The rockets landed in an open area near the border fence. No casualties or damage was reported. Three mortar shells were fired at an area near the security fence. There were no casualties and no damage reported. The military-terrorist wings of the Democratic Front for the Liberation of Palestine (DFLP) and the Popular Front for the Liberation of Palestine (PFLP) separately claimed responsibility for the mortar shell fire. A rocket hit was identified in an open area in the western Negev. There were no casualties and no damage reported. One rocket hit was identified on night of December 23 near a bus stop in the western Negev. On December 26, two rockets fell in open areas near Ashqelon. There were no casualties and only minor damage reported from the two incidents. Three mortar shells were fired from the Gaza Strip, targeting an IDF force engaged in routine activities along the security fence between Israel and the Gaza Strip. There were no casualties and no damage reported. Two mortar shells targeting Israel were fired from the Gaza Strip. One landed close to an IDF force engaged in routine operations near the security fence. No casualties or damage were reported. On October 27, two mortar shells fired from Gaza landed in southern Israel. On October 28, one rocket fire by Palestinian terrorists in Gaza slammed into an uninhabited area in the Ashkelon Coast Regional Council area. A second rocket fired from Gaza was destroyed by an interception of the Iron Dome system outside Ashkelon. One rocket hit was identified in Israeli territory. The rocket fell in an open area; there were no casualties and no damage. One rocket hit was identified in an open area in the western Negev. There were no casualties and no damage reported. On August 13, a rocket hit was identified in an open area in the western Negev. There were no casualties and no damage reported. That same night, two explosions were heard in Eilat caused by two rockets launched from Sinai. Two civilians were treated for shock and a woman broke her leg while running to take cover. The Gaza-based Mojahideen Shura Council of the Environs of Jerusalem issued an announcement claiming responsibility. On the night of August 7 a rocket hit was identified in an open area in the western Negev. There were no casualties and no damage was reported. Two rockets were fired on July 24 and another on July 30 - the first full day of resumed peace talks between Israel and the Palestinian Authority. All three rockets landed in southern Israel but caused no damage or casualties. Palestinian terrorists in Gaza fired six rockets on the night of June 23. Four hits were identified near Netivot and the Bnei Shimon Regional Council. Two more rockets were fired toward Ashkelon but were intercepted by Iron Dome. On June 19, terrorists fired three rockets toward Ashkelon, though no hits were reported and the rockets are believed to have struck inside Gaza. One rocket hit was identified in an open area in the western Negev during the Shavuot holiday. There were no casualties and no damage reported. Three rocket hits were identified in southern Israel. On April 27, one rocket struck the Sdot Negev Regional Council; on April 29, one rocket landed in the Eshkol Regional Council. On May 2, two mortar shells struck the Eshkol Regional Council. No injuries or damage was reported for any of the hits. Three rocket hits were identified in southern Israel. There were no casualties and no damage reported. Two GRAD rockets struck the southern Israeli coastal city of Eilat. One landed in a residential area but no injuries were reported. The IDF said the rockets were fired from the Sinai Peninsula. A Salafist organization called the Mujahideen Shura Council of Jerusalem took responsibility for the fire, which it claimed was a retaliation for Israeli attacks on Palestinian protesters, but did not reveal where it launched the rockets from. Palestinian terrorists in Gaza fired two Qassam rockets toward the western Negev on the morning of April 3 morning, as Israeli children in Sderot and Sha'ar Hanegev were making their way to schools and kindergartens after the Passover holiday. No injuries or damage were reported. Defense Minister Moshe Ya'alon said "Israel holds Hamas responsible for everything that is fired from Gaza." On April 2, three mortars were fired from Gaza toward Israel. One shell landed in the Eshkol Regional Council, without causing injury or damage. The Palestinian terror organziation Majlis Shura al-Mujahadeen claimed responsibility for firing four rockets at Israel, two of which landed in Sderot while the other two landed within Palestinian Gaza. Hamas said it had no connection to the attack which came on the morning of President Obama's second day in Israel during his inaugural visit to the Jewish State as President. No injuries were reported. PA President Mahmoud Abbas condemned the attacks. Al-Aqsa Martyrs Brigades took resonsibilty for firing a GRAD rocket, which fell on a road south of Ashkelon causing some damage to a road. No injuries were reported. This was the first attack since cease-fire was signed after Operation Pillar of Defense in November 2012. On the morning of November 15, three Israeli civilians were killed when a rocket directly struck their apartment building in the city of Kiryat Malachi. Three children, among them two young babies, were also wounded in the strike. Three IDF soldiers were wounded in a separate attack when mortar shells exploded inside their base near the Gaza border. On November 16, a rocket fired from Gaza landed outside Jerusalem. On November 20, an IDF soldier - Cpl. Yosef Fartuk - and a civilian - Alayaan Salem al-Nabari - were killed when a mortar fired from Gaza exploded in the Eshkol regional council. Five IDF soldiers were wounded when a rocket landed inside their holding area on the Gaza border. Also on November 20, a GRAD rocket scored a direct hit on a residential apartment building in the city of Rishon L'Tzion, wounding one person moderately and sending nearly ten others to the hospital with shock. In total, terrorists in Gaza fired more than 1,500 rockets at Israel during this period - 933 struck inside Israel, 421 were intercepted by the Iron Dome Missile Shield, and 152 rockets landed inside the Gaza Strip. In distinct escalation, Palestinian terrorists in Gaza launched more than 150 rockets at Israel; at least 121 rocket hits were identified in Israeli territory. A total of 64 rockets hits were identified on November 11. A number of mortar shells were also fired. A number of Israeli civilians were wounded by the rocket fire, although not seriously; several were treated for shock and there was extensive property damage. Two rockets fired from Gaza hit Israel. In a new round of escalation in southern Israel, of the many more rockets and mortar shells that Hamas and the Popular Resistance Committees fired from the Gaza Strip, 105 rockets and 12 mortar shells landed in Israel.One of the rockets was a long-range Grad that fell in an open area on the outskirts of Beersheba. Five rockets from Gaza hit southern Israel. Two civilians were treated for shock after one of the rockets fell in their yard. Seven rockets from Gaza hit into Israeli territory were identified. One grad rocket landed in southern Israel near Netivot, in the yard of a youth center. No injuries were reported but three people were treated for shock including one person who was evacuated to a hospital. Another rocket hit close to a house in the Hof Ashkelon area. Most of the remaining rockets hit in the southern town of Netivot. Most of the rockets landed in open areas, but one landed in a petting zoo in the Eshkol region, killing two goats and wounding nine others. Three rockets landed in Israeli territory. There were no casualties and no damage was done. Three rockets landed in open areas. There were no casualties and no damage from these rocket attacks. Four long-range rockets landed in Israeli territory near the town of Netivot and the city of Beersheba. Two homes in Netivot were severely damaged and a number of residents were treated for PTSD (Sept 9). Networks affiliated with the global jihad claimed responsibility for most of the rocket attacks. There was an increase in rocket hits targeting the western Negev; 12 hits in all were identified, most falling in open areas. On August 31 two rocket hits were identified in the southern city of Sderot. One of them hit two residential buildings. On September 2 a Grad rocket hit was identified near the town of Netivot. On August 26, three rockets fell in Sderot; there were no casualties but factories were damaged. On August 27, the first day of the new school year, three rockets fell at around 8:00 in the morning, as elementary and kindergarten children were on their way to school. One of the rockets fell in Sderot in an open area. There were no casualties and no damage. A group calling itself the Holy Fighters of Greater Jerusalem said in an announcement that the rockets had deliberately been fired on the first day of school. Two Grad rockets were launched from the Sinai Peninsula and targeting the city of Eilat. The remains of one of the rockets were found in a hilly region near the city. Hit identified in southern Israel. The rocket fell in open areas. There were no casualties and no damage. Hits were identified in Israeli territory. The rockets fell in open areas. There were no casualties and no damage. Hits were identified in Israeli territory, landing near Sderot and Ashkelon. The rockets fell in open areas. One Israeli woman suffered minor wounds; no property was damaged. On July 24 the Iron Dome system intercepted and destroyed a rocket targeting the Ashqelon area. During this week, three rocket hits were identified in Israeli territory. The rockets landed in open areas; there were no casualties and no damage. On July 9 a mortar shell was fired into the western Negev. There were no casualties and no damage. On June 27 one rocket hit was identified in one of the western Negev communities, damaging a chicken coop. Two rockets targeting the southern city of Netivot were intercepted and destroyed by the Iron Dome aerial defense system. Another round of escalation began after terrorist attacks along the Israeli-Egyptian border forced the IDF to target terrorist headquarters in the Gaza Strip. In response the terrorist organizations in the Gaza Strip initiated massive barrages of rockets targeting towns and villages in Israel's western Negev. The greatest number of rockets landed on June 20, when about 70 rockets hit the western Negev. The rockets damaged a number of buildings, including a school in Sderot. Two civilians were wounded and several suffered slight injuries, while several had to be treated for shock. Hits were identified in Israeli territory. Two GRAD rockets were apparently fired from the northern Sinai Peninsula on June 16 and landed north of Eilat. The other six were fired on June 18 and 19 and fell in the western Negev. All the rockets fell in open areas; there were no casualties and no damage. Identified in an open area in the Western Negev. There were no casualties and no damage. Identified in Israeli territory in the western Negev. On the night of June 3, two rockets landed in open areas in the western Negev; there were no casualties and no damage. On the night of June 4, a rocket landed in a wheat field near Ashkelon, setting the field on fire. There were no casualties. Identified in an empty area in the western Negev. There were no casualties and no damage. Identified in the western Negev, falling in open areas. There were no casualties and no damage. On Israeli Independence Day (April 25) a rocket strike from Gaza was identified in southern Israel. A few days later, another rocket landed near Sderot. There were no casualties reported. Identified hit in an open area of the Western Negev desert. There were no casualties or damage caused. On April 4, three rockets struck the southern resort town of Eilat, fired from the Sinai Peninsula. On April 8, three rocket hits were identified in the Western Negev. On April 15, two rockets fell in open areas in the western Negev desert. There were no reports of casualties. Strikes from Gaza were identified in Israeli territory. There were no casualties and no damage. Rocket and mortar hits were indentified in southern Israel despite a tenative arrangement with Hamas to cease rocket fire after the escalation of mid-March. In addition, two rockets were intercepted and destroyed by the Iron Dome aerial defense system. Rockets hits were identified in all the major cities and towns of southern Israel, including Beersheba, Ashdod, Ashkelon, Yavne, and Netivot. The Iron Dome Anti-Missile System deployed around southern Israel was successful in intercepting approximately 60 rockets that were destined to strike in densely populated areas. A GRAD rocket scored a direct hit on an elementary school in Beersheba, thankfully with no one present. Around 30 people sustained injuries including those taken to hosptials for shock. Israel responded to the escalation by targeting rocket launching squads in the Gaza Strip. Hits identified in the western Negev. There were no casualties and no damage. Hits identified in Israeli territory. The rockets fell in open areas; there were no casualties and no damage. Hits identified in southern Israel, some of them long-range rockets. Hits identified in Israeli territory. They fell in open areas in the western Negev. One of the rockets damaged a number of structures and caused a power outage. Hits identified in Israeli territory - four on February 1 which landed in open areas in the western Negev. There were no casualties and no damage. Hits identified in Israeli territory, all in open areas. There were no casualties and no damage. There were no casualties and no damage reported. Rockets were fired from Gaza and hit in an open field in the western Negev. No injuries were reported. Mortars containing phosphorous were fired at Sderot and a village in the western Negev. The military-terrorist wing of the Popular Resistance Committees claimed responsibility for the attack. Hits identified in Israeli territory. All the rockets and mortar shells fell in open areas in the western Negev. There were no casualties and no damage. Fired into Israeli territory from the Gaza Strip. Two rockets fell in an open area in the western Negev on December 24. A third rocket fell on December 26. Two mortar shells fell on December 23 in open areas. There were no casualties and no damage. Fired from Gaza into Israeli territory. They landed in open areas in the western Negev. There were no casualties and no damage. Rockets struck civilian areas in southern Israel. At dusk on Friday, December 9, two rockets were fired towards Ashdod (pop. 200,000) - one was shot down by the Iron Dome anti-rocket system while the other fell in an open field. Another rocket landed at the Eshkol Regional Council. One of the rockets landed in an open area near Ashkelon while another was reported having hit in the Negev desert area. There were no reports of damage or injuries. Hit identified near the security fence in the western Negev. There were no casualties and no damage. Hits identified in Israeli territory. Both fell in open areas in the western Negev. There were no casualties and no damage . One of the rockets hit a storage shed near a kindergarten in an Israeli village in the western Negev. The other fell in an open area. There were no casualties reported. The rocket fell in an open area. There were no casualties and no damage. They were all launched on November 6, and fell in the western Negev in the Ashkelon district. There were no casualties and no damage. Rockets struck Ashdod (pop. 200,000), Ashkelon (pop. 113,000), Gan Yavne (pop. 19,000) and the Eshkol Regional Council, killing one person - 56 year old Ashkelon resident Moshe Ami - and injuring approximately 30 others. Several buildings, including a school, were damaged in the attacks. The IDF views this as a major escalation after more than two weeks of quiet on the southern front. Fired from Gaza - one hit was identified in Israel, the other rocket landed inside Gaza. There were no reported injuries. Identified hit in an open area in the western Negev. There were no casualties but power lines were damaged. Hit identified in an open area in the western Negev. There were no casualties and no damage. Hits identified in open areas in the western Negev. There were no casualties and no damage. One rocket fell in an open area in the western Negev on August 31. The second fell in an open area in the western Negev on September 5. There were no casualties and no damage reported. Fired at southern Israel from the Gaza Strip. There were no immediate reports of damage or injury. 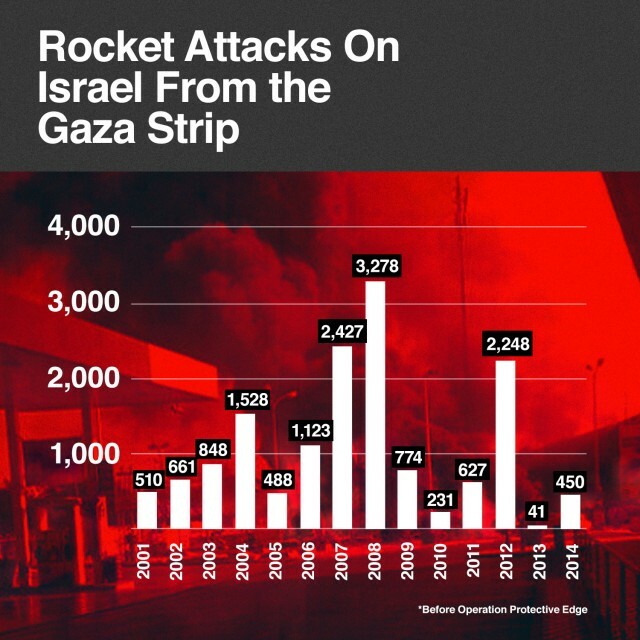 More than 150 rockets and 45 mortars were fired into Israel from Gaza in August 2011 alone. Fired from Gaza into southern Israel in the one of the largest escalations in recent years. Rockets struck in almost every major Israeli city in the south of the country, including Beersheba, Ashkelon and Ashdod. At least 13 civilians were injured in the barrages and one, 38 year old Yossi Shoshan, was killed. On August 24, a nine-month old infant was lightly wounded when a rocket exploded near where she was being held. At least 7 rockets were intercepted and destroyed by the Iron Dome anti-missile system. One of the mortars fired at Israel contained illegal white phosphorous, an incendiary chemical that burns and leads to boils. Despite a ceasefire reached between Israel and Hamas on August 22, missiles continued to be fired. At least seven injuries being reported. One rocket hit a yeshiva while another rocket landed on a synagogue, though did not explode. The Gaza-based, Al-Qaeda-linked Abdullah Azzam brigades claimed responsibility for shooting at least two rockets on August 19. Hits identified as striking in southern Israel. No injuries were reported as a result. On August 15 a 122mm GRAD rocket fell in an open area near Beersheba. No casualties and no damage were reported. Two of the rockets had longer ranges than usual and landed near the southern Israeli city of Kiryat Gat - an improved locally-manufactured rocket (August 3) and what was apparently a 122mm Grad rocket (August 4), after which a number of civilians were treated for shock. Another rocket fired on August 4 landed in the western Negev. Six mortar shell hits were identified in Israeli territory. They fell in open areas in the western Negev. No casualties were reported and no damage. Hits identified in the western Negev (July 28 and August 1). An Israeli civilian woman suffered minor wounds from the rocket fired on August 1. Identified in the western Negev. Identified in Israeli territory. Most of the rockets fell in open areas in the western Negev. There were no casualties and no damage. Hits identified in Israeli territory (July 9). The rockets fell in open areas in the western Negev. There were no casualties. Hit identified in Israeli territory (July 3) in an open area in the western Negev; there were no casualties and no damage. On July 2 two mortar shells fell in an open area in the western Negev. Hits indentified in Israeli territory (June 21) in an open area in the western Negev. There were no casualties and no damage. Hit indentified in Israeli territory (June 16) in an open area in the western Negev. There were no casualties and no damage. Hit identified in an open area in the western Negev (May 28). There were no casualties and no damage. It was the first rocket hit since April 18. Hits indentified during the Passover holiday. One Grad rocket landed near the city of Ashdod on April 15; there were no casualties and no damage. The other (April 18) landed in an open area in the western Negev. Fired at Israeli territory. Some of the rockets were long-range and fell in the regions of Beersheba, Ashqelon and Ashdod. Eight of them were intercepted by the Israeli Iron Dome aerial defense system. Hamas operatives fired the missile an Israeli school bus in the western Negev. Two people were injured from the attack, one later died of his wounds. 16 year old student Daniel Viflic of Bet Shemesh died from his wounds suffered during the attack. Luckily the attack took place just minutes after the majority of students had been dropped off. Hits identified in Israeli territory. All three rockets fell in open areas in the western Negev. There were no casualties and no damage. Identified in Israeli territory. On March 23, six mortar shell hits were identified in the western Negev south of Ashkelon. One of them contained phosphorous.On March 24, five rocket hits were identified, one of them a Grad rocket which landed near the southern Israeli city of Ashdod. Five mortar shell hits were also identified, all fired simultaneously, falling in open areas in the western Negev. On March 26, two rockets landed in the western Negev. There were no casualties but damage was done to property. Hits identified in Israeli territory, one south of the city of Ashkelon on March 20. No damage was done. Several Israelis were treated for shock. There were no casualties and no damage. Identified in open areas in the western Negev. There were no casualties and no damage. Hits identified in Israeli territory. They fell in open areas in the western Negev on March 5. There were no casualties and no damage. Hits identified, including a 122mm Grad rocket which fell in the southern Israeli city of Beersheba. The rocket hit a house and caused considerable damage to the building and its surroundings. Four people were treated for shock. Identified in the western Negev; there were no casualties and no damage. Hits identified in Israeli territory. Rocket landed in an open area in the western Negev. There were no casualties and no damage. Two of the rockets were Grad rockets. Hits identified and in open areas in the southern Israeli towns of Netivot (close to a site where a wedding was being held) and Ofakim. Four people went into shock and several vehicles were damaged. Mortar fell in an open area in the western Negev. There were no casualties and no damage. The rocket fell in an open area in the western Negev. There were no casualties and no damage. Hit Western Negev. The rockets fell in open areas. There were no casualties and no damage. Six civilians were wounded, one of them critically. The main attacks were the following: On January 5, seven rocket hits were identified in the western Negev. There were no casualties and no damage. On January 6, seven mortar shell hits were identified over a 24-hour period. Two mortar shells hit a building and wounded six foreign workers, one of them critically and one seriously. On January 7 a rocket hit was identified near the security fence. There were no casualties and no damage. On January 10 three rocket hits were identified near the city of Ashkelon and one in an open area. There were no casualties and no damage. Two (2) rocket hits were identified in the western Negev (December 28 and 30). They fell in open areas. There were no casualties and no damage. Three mortar shell hits were identified in the western Negev. On January 1 a women in the western Negev went into a shock. Five (5) mortar shell hits were identified in Israel territory, most of which fell in open areas. On December 24 a rocket hit was identified in an open area in the western Negev. There were no casualties and no damage. 15 mortar shells were fired at the western Negev. On December 20, 12 mortar shells were fired and landed in open areas. On December 19 three mortar shells were fired and landed in open areas. There were no casualties and no damage. A rocket hit was identified on December 21. It fell in the western Negev. A young woman sustained minor injuries. Two (2) rocket hits were identified in Israeli territory. There were no casualties and no damage. In addition, six mortar shells were fired into the western Negev, two on December 7 and four on December 8. In the December 8 attack an Israeli civilian sustained minor injuries. Two (2) rocket hits and one mortar shell hit were recorded in the western Negev. On December 6 one of the rockets fell in the western Negev, causing no injuries or damage. Six (6) mortar shells were fired into Israeli territory. They fell in open areas in the western Negev. There were no casualties and no damage. At least one of the mortar shells contained phosphorous. On November 16 a rocket hit was identified in an open area in the western Negev, causing damage to property. On November 19, three rocket hits were identified, including a 122 mm Grad rocket in Ofakim. There was damage to property and livestock. One (1) rocket hit was identified in the western Negev. Two (2) mortar shells were fired at an IDF force conducting routine security activity. There were no casualties and no damage. A number of mortar shells were fired at an IDF force conducting routine patrols. Three mortar shell hits were identified in the western Negev. One (1) mortar shell hit and one (1) rocket hit were identified in Israeli territory. Two (2) rockets fell in Israeli territory in the western Negev. One (1) rocket hit was identified in Israeli territory. Nine (9) mortar shells were fired into Israeli territory, eight of them on September 15. They fell in open areas in the western Negev. There were no casualties and no damage. Increase in rocket fire targeting the western Negev. During the week (which included Rosh Hashanah, the Jewish New Year) nine (9) rocket hits were identified in Israel. Most of them fell in open areas. There were no casualties and no damage. One (1) rocket hit was identified in the western Negev. There were no casualties and no damage. On August 16 two Kassam rockets fell in the northwestern Negev. On the morning of August 17 two mortar shells were fired at an IDF force near the security fence. Two soldiers sustained minor wounds. Two mortar shells fell in an open area in the northwestern Negev. On August 16 Israeli security forces prevented an attack against IDF forces with an IED near the security fence in the southern Gaza Strip. One of the terrorists was killed - a prominent member of the Palestinian Islamic Jihad who took part in the exchange of fire five months ago in which an IDF soldier was killed - and an IDF soldier sustained minor wounds. On August 2 six (6) rockets were fired at Israel. Three fell in Eilat. There were no casualties. Two rockets fell in the Jordanian city of Aqaba. A Jordanian civilian was killed and five were wounded, one of them critically. Five (5) rocket hits were identified, four of them on July 24. There were no casualties and no damage. On July 20 a mortar shell was fired at an IDF force on routine patrol along the security fence. One (1) mortar shell was fired at IDF soldiers on a routine patrol along the security fence. On June 24, 12 mortar shells were fired from the Beit Hanoun region at an IDF force engaged in routine security activities. Six fell in Israeli territory. The force was also attacked with light arms fire. On June 28 a mortar shell was fired at an IDF armored vehicle. The vehicle was damaged. On June 30 one rocket his was identified in the western Negev. A local factory was damaged. Two (2) rocket hits were identified near the security fence in the western Negev. There were no casualties and no damage. A number of IEDs were detonated and light arms were fired at IDF patrols near the security fence. One (1) rocket hit was identified in the western Negev. On June 9 an IED exploded near an IDF force on routine patrol near the security fence in the southern Gaza Strip and on June 14 near an IDF force carrying out routine security activities in the southern Gaza Strip. There were no casualties and no damage. Six (6) rocket hits were identified in Israeli territory, three on May 31 and three on June 1. All the rockets fell in open areas. There were no casualties and no damage. Also on June 1 an anti-tank missile was fired at an IDF force engaged in routine security activity near the border fence in the southern Gaza Strip. On two occasions (June 1 and 7) the Israeli Air Force attacked rocket-launching squads which were about to fire rockets into the western Negev. On the morning of June 1 an IDF force identified two terrorist operatives who crossed the security fence in the southern Gaza Strip. During the ensuing exchange of fire the terrorists were killed.On June 7 an IDF force attacked a commando terrorist squad at sea. The squad was apparently on its way to Israel from the sea to carry out a terrorist attack. Four members of the squad were killed. Seven (7) rocket hits were identified in the western Negev (five of them on May 26). The rockets fell in open areas. There were no casualties and no damage. Two (2) rockets fell in Israeli territory (May 19 and 20). They exploded in open areas. On May 21, two terrorists infiltrated into Israeli territory near Nirim in the western Negev. IDF forces shot and killed them. Two assault weapons and magazines were found near the bodies. On the evening of May 21, during a routine patrol in the southern Gaza Strip, an IDF scout was seriously wounded by sniper fire. On May 25 an IDF force identified a suspicious Palestinian driving a wagon close to the security fence. After he distanced himself from the wagon, which was apparently booby trapped, it exploded. There were no casualties. One (1) mortar shell was fired at an IDF force carrying out routine operations near the security fence; civilian engineers working near the security fence and and IDF force carrying out routine activities near the Kissufim post were attacked with light arms (May 12); two IEDs exploded near an IDF force carrying out routine operations at the security fence, damaging the fence (May 14). One (1) rocket hit was identified in the western Negev. There were no casualties and no damage. IDF soldiers were attacked twice with light arms near the border fence. Small arms fire was opened several times on IDF soldiers engaged in routine security activities near the border fence. There were no injuries. Light-arms fire targeted civilians engaged in non-military activities near the security fence. There were no casualties. On the same day, an IDF force found three mines near the security fence in the central Gaza Strip. On April 16, an IDF force identified a suspicious figure apparently trying to set an IED near the security fence along the Gaza Strip, near Kfar Aza. The terrorist threw a grenade at the force. The IDF force returned fire and killed him. In the early morning hours of April 13 an IDF force identified a terrorist squad in placing an IED near the security fence close to the Kissufim crossing. A total of five (5) rocket hits were identifed in Israeli territory; four others fell inside the Gaza Strip. Three (3) mortar shells were also fired, two at an IDF force during the incident on March 26. There were no casualties. Responsibility for the rocket and mortar shell fire was claimed by the Palestinian Islamic Jihad, the Popular Front for the Liberation of Palestine, and Fatah’s Al-Aqsa Martyrs Brigades. On March 26 an IDF officer and soldier were killed and four others were wounded near the Kissufim crossing in the central Gaza Strip. The Izz al-Din al-Qassam Brigades, Hamas' military-terrorist wing, claimed responsibility for the incident. Significant increase in the number of rockets fired into the western Negev, with nine (9) identified rocket hits. Five other rockets fell inside the Gaza Strip. On March 18 a rocket hit a greenhouse in Netiv Ha'asara, killing a Thai worker. He was the first rocket fire victim since Operation Cast Lead. Two (2) rocket hits were identified from Gaza firing at the western Negev. There were no casualties. On March 14 light arms were fired at a motorized IDF patrol moving along the border security fence. There were no casualties. On February 25, 2010 patrol found a rocket launcher and rocket near the security fence. The launcher was detonated in a controlled explosion by IDF experts. On March 1 an IDF tank shot at a squad of Palestinians who approached the security fence near Beit Lahiya in the northern Gaza Strip, killing one terrorist and wounding others. A search of the area revealed a mortar and detonation system. An anti-tank missile was fired at the searchers. There were no casualties reported. Two hits (apparently mortar shells) were identified near the security fence inside the Gaza Strip. The Democratic Front for the Liberation of Palestine claimed responsibility for the fire, aimed at an IDF force. On February 18 an IED was detonated against an IDF patrol, lightly wounding one soldier. One (1) rocket hit was identified in the western Negev. There were no casualties and no damage. On February 10, a squad of suspicious Palestinians was identified and fired on near the Erez crossing. Two (2) rocket hits (Feb 3 and 7) were identified in open areas near population centers. There were no casualties and no damage. Two (2) rocket hits were identified in open areas in the western Negev. There were no casualties and no damage. Three (3) rocket hits and one (1) mortar shell hit were identified in open areas in the western Negev. In addition, a number of rockets and mortar shells were fired and landed in the Gaza Strip. There were no casualties and no damage. Seven (7) rocket hits were identified in Israel, most on January 7. In addition, an IDF force was shot at near the Karni crossing (Jan 7), and an IED exploded near an IDF force patrolling along the security fence (Jan 10). Two (2) rocket hits were identified in the western Negev. For the first time since Operation Cast Lead, a rocket hit was identified in the southern Israeli city of Netivot (Jan 2). Responsibility was claimed by the military-terrorist wing of the Popular Front for the Liberation of Palestine. There were no casualties. One women was treated for shock. In addition, a mortar shell was fired at an IDF force near the security fence (Jan 4) and four mortar shells were fired at the Kerem Shalom and a rocket at the Kissufim crossings (Jan 1). Two (2) rocket hits were identified in the western Negev. They fell in open areas, there were no casualties and no damage. Two (2) rocket hits were identified in the western Negev. They fell in open areas, there were no casualties and no damage. On December 12 Palestinians opened fire with light arms on an IDF force in the Kissufim region. There were no casualties. An IDF force shot at five Palestinians suspected of terrorist activities sighted in Israeli territory after an RPG was fired at an IDF jeep. One (1) rocket hit was identified in an open area in the western Negev (December 4). There were no casualties and no damage. On December 4 an IDF patrol was attacked with RPG and light arms fire near the security fence in the central Gaza Strip. Four (4) rocket hits were identified in open areas near towns. On November 16 two mortar shell were fired.There were no casualties and no damage. On November 18 an IED was used to attack an IDF force near the security fence south of the Karni crossing. Light arms were used to attack an IDF force near the Kissufim crossing. Three (3) rocket hits were identified. All three landed in open areas in the western Negev; there were no casualties and no damage. On November 13, An IDF force identified a squad laying an explosive device in the northern Gaza Strip, and opened fire. One (1) rocket hit was identified in an open area near a town in the western Negev on October 21. There were no casualties. On October 20, three mortar shells were fired at an IDF force and on October 21, shots were fired at an IDF force near the security fence. Two (2) rocket hits were identified in open areas in the western Negev (October 13 and 18). There were no casualties and no damage. One (1) mortar shell hit was identified in an open field near Sderot (October 7, 2009). There were no casualties and no damage. On October 6 civilians working near the Karni crossing were attacked with light arms fire. Five (5) rocket hits were identified in open areas near Israeli communities (another rocket fell inside the Gaza Strip), There were no casualties and no damage. In addition, light arms were used to attack IDF force and Israeli civilians near the security fence. Three (3) rocket hits were identified in the western Negev (the Palestinians fired other rockets which landed inside the Gaza Strip). One mortar shell was fired. There were no casualties and no damage. Shots were fired at IDF patrols and Israeli civilians working near the security fence, near the Sufa and Kissufim crossings. Two (2) rocket hits were identified in the western Negev and a mortar shell was fired at civilians working near the security fence. IDF patrols and Israeli civilians working near the security fence were also shot at, mostly with light arms. On September 20 an IDF force shot at a terrorist squad planting IEDs southeast of Jabaliya, killing two terrorists and wounding three. Three (3) rocket hits were identified and seven (7) mortar shells hits were identified in open fields in the western Negev. There were no casualties and no damage. On September 3, 2009, during a 24-hour period, seven mortar shells were fired, four at an IDF force near the security fence and three at communities in the western Negev. There were no casualties and no damage was done. In an exceptional statement, the Iz a-Din al-Qassam Brigades, Hamas’ military-terrorist wing, claimed responsibility for the attacks. Palestinians also shot at civilians working the near security fence, damaging a tractor, and at an IDF force near the security fence in the central Gaza Strip which returned fire. One (1) rocket hit and two (2) mortar shell hits were identified near a village in the western Negev. One mortar landed in an IDF base north of the Gaza Strip, slightly wounding a soldier.There were no casualties and no damage. On August 27, 2009 Palestinians opened fire at Israeli civilians engaged in non-military activities near the security fence in the southern Gaza Strip. There were no casualties and no damage. On August 30, 2009 Palestinians opened fire at Israeli civilians conducting an engineering project near the security fence in the northern Gaza Strip. There were no casualties and no damage. One (1) mortar shell was fired at Israel civilian working near the border fence. One (1) rocket hit was identified in the western Negev. On August 10, Israeli civilians working near the Karni crossing were attacked by small arms fire. On August 9, two mortar shells fell near the Erez crossing inside the Gaza Strip. The attack occurred as a Palestinian heart patient was being transferred to an Israel ambulance on his way to medical treatment in Israel. On July 16, 2009 a rocket hit was identified south of Kibbutz Nahal Oz. There were no casualties and no damage was done. On July 19 armed Palestinians launched RPGs and mortar shells at an IDF force patrolling the border fence near Kibbutz Nahal Oz. On July 23, 2009 light arms were fired from the Gaza Strip at a group of Israeli civilians working near the Sufa crossing. There were no casualties. On July 7, 2009 a mortar shell was fired at an IDF patrol near the Karni crossing, falling in Israeli territory. On July 11 a mortar shell was fired near the Karni crossing, falling inside the Gaza Strip. On July 2, 2009 an IDF patrol was fired on south of the Karni crossing. On July 5 three mortar shells were fired at an IDF patrol near the Sufa crossing. On June 29 two Palestinians were observed placing an IED 2 kilometers southwest of the Karni crossing. On June 25, 2009 light weapons were fired at the Nahal Oz fuel terminal; there were no casualties.On June 21, 2009 an IDF force on routine patrol uncovered four IEDs placed along the border security fence in the Kissufim region of the western Negev . As the IEDs were being disarmed, two mortar shells were fired and light arms were used to attack the soldiers. There were no casualties. One (1) rocket hit was indentified in the western Negev . There were no casualties and no damage was done. One (1) rocket hit a house in the southern city of Sderot, causing damage. Two people were treated for shock. Four (4) rockets and two (2) mortar shell hits were identified, all of them in non-inhabited areas. There were no casualties and no damage was done. One (1) rocket and three (3) mortar shells were fired at Israel. Two (2) rockets were fired at the western Negev falling in open fields. Two (2) rockets and two (2) mortar shells were fired at Israel. No injuries or damage was reported. Two (2) rockets and one (1) mortar shell were fired at Israel. On March 31, following the prevention of an attempt to place an IED near the border security fence, two rockets and a mortar shell were fired at western Negev communities. Three (3) mortar shells were fired at IDF forces operating along the border security fence. Hamas's Izz al-Din al-Qassam Brigades claimed responsibility for the mortar shells fired on March 22. Fourteen (14) rockets and four (4) mortar shells fell in Israel, most of them in open areas, causing neither casualties nor property damage. Seventeen (17) rockets were fired, one of them hitting the city of Netivot. There were no casualties or property damage. Nine (9) mortar shells were launched. On March 5 an anti-tank missile was fired at an IDF patrol moving along the border security fence. In response the Israeli Air Force attacked the squad. The Palestinian Islamic Jihad claimed responsibility for the missile attack. Twenty-five (25) rocket hits were identified. Two 175mm upgraded long-range rockets with a maximum range of 18 kilometers (11 miles) hit Ashkelon on February 28, one hitting a school building and causing serious damage. No mortar shells were fired. • Mar 1 - Nine rocket hits were identified in the western Negev, one hitting a house in Sderot. No casualties were reported. • Feb 28 - Seven rocket hits were identified, including two long-range rockets that struck in Ashkelon, one causing heavy damage to a school building when shrapnel penetrated the walls of several classrooms. Seven people living nearby suffered stress-related trauma. • Feb 27 - 2 rocket hits were identified. There were no casualties and no damage was caused. • Feb 26 - 3 rockets landed in Israeli territory, two in Sderot. One rocket hit a house and the other landed in an outdoor area near the industrial zone. There were no casualties, but the house was damaged. • Feb 19 - Four rocket hits were identified - one fell near Sderot. There were no casualties and no damage was reported. • Feb 20 - Six mortar shells were fired at IDF forces. There were no casualties and no damage was reported. • Feb 20 - A three-man Palestinian terrorist squad placed an IED four kilometers northeast of the Kissufim post, and then fled. • Feb 23 - Two rocket hits were identified near Sderot. There were no casualties and no damage was reported. A terrorist squad attempted to place an IED three kilometers north of the Kissufim post. The Israeli Air Force attacked the squad. Thirteen (13) rockets were fired, one of them a 122mm long-range Grad rocket, which landed southwest of the city of Yavneh. In addition, six mortar shells were fired, mostly at IDF forces. Two mortar shells were fired at an Israeli Navy vessel near the Gaza shore, and a number of IEDs were detonated against IDF forces. In all the above incidents there were no casualties and no property damage was reported. February 8 - Rocket fell in kibbutz parking lot in northwest Negev. Another fell south of Ashkelon. February 6 - Rocket fired from the area of Beit Lahiya in northern Gaza Strip hit western Negev. Another rocket fell south of Ashkelon. February 3 - A 122mm Grad rocket fell between two buildings in the city of Ashkelon. February 1 - Six mortar shells fired into Israeli territory, armed Palestinians shot at IDF force near Kissufim in western Negev and four rockets were fired at western Negev towns and villages. January 31 - A rocket fell south of Ashkelon. January 29 - A rocket fell in an open area near Sderot. January 28 - A rocket fell in Israeli territory near the southern Gaza Strip. January 27 - An IED was detonated against IDF patrol north of Kissufim. January 25 - Terrorist squad tried to carry out rocket attack against Israel. One rocket fired, fell inside Gaza Strip. January 20 - Eleven mortar shells fired at IDF forces and into Israeli territory and terrorists shot at IDF force near border security fence in central Gaza Strip.